1/2 large head of cauliflower or 1 small head. Grate the cauliflower in a food processor or by hand into fine shreds. Place the flour in a large bowl or in the bowl of a stand mixer. Mix in the salt. With your hand or the dough hook, knead into a soft, pliable, but not sticky dough. Set aside for at least 30 minutes. Heat the oil in a saucepan on medium-high heat and add the mustard seeds. When they sputter, add the grated ginger, coriander powder, turmeric, and chilli powder. Mix quickly and then add the grated cauliflower and salt. Stir to mix thoroughly. We are cooking the cauliflower to get as much of the moisture out of it as possible, so do not cover it. Dehydrating the cauliflower will not only make it taste better in the paratha, it will also make it easier to roll the parathas out. Stir the cauliflower frequently. A good way to tell that the cauliflower is done is when it starts to stick to the bottom of the saucepan. This should take about 15-20 minutes. Don't let it burn though. Mix in the dill and coriander and add more salt if needed. Remove from the fire and allow to cool. Take each piece and roll it into a smooth ball in the palms of your hands. Using your fingers, or with a rolling pin, roll out each piece into a round, about 4 inches in diameter. Now place some filling inside the circle. 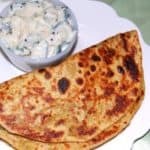 I like to stuff the parathas as much as I possibly can, to get the most flavor. Gather the edges and pinch together at the top to seal into a dumpling. Press down the top. Dust the round with some flour and roll out gently into a 6-7 inch circle. I like my parathas really thin, but traditionally they are rolled out fairly thick. If some filling squeezes out, don't panic. Just dust with some dry flour. Heat a cast-iron or nonstick skillet. Place the paratha on the hot skillet. When it turns opaque and small bubbles appear, flip around. At this stage you can spray the parathas with some oil to make them really crispy. Flip over again and cook both sides until golden-brown spots appear.